I have my father's 1963 Jack Taylor International frame in a 1977 build w/JT Track fork. All of the other original parts except for the handlebars have deteriorated or have been replaced with lower-end stuff. I'm interested in restoring it to a nice vintage build worthy of the frame. First, the wheels and brakes: the frame, I believe, was built with the larger 27" wheels in mind, but they have since been replaced with 700c wheels. This has increased the brake reach to a point where it's not possible to find a nice set of vintage brakes that will span it. So: in terms of period-appropriate racing wheels, are there brands/models that would be appropriate to put on a 1963 Jack Taylor that are commonly available in NOS or used? I was thinking NR hubs, but I have no Idea which rims would be best. As for brakes, the ones that were on the bike in 1977 were Mafac Racers, but I was hoping for something a little more upmarket? Gabe, As you will know, the Taylor brothers were fine frame builders, I sold some of their frames in the 1950's. Wheels. The sprint rims from Fiamme (14 ounces) or Mavic (11 ounces) would be right, these are more likely to have survived than the light wood insert types. Plenty of choice of tubular tyres. Far more lively to ride, especially with light tyres. Do you mean it has round front forks, but has it got forward facing rear drop outs? Please put up pictures, or email to me if you can't. The current brakes are Weinmann 7300s, but one of the calipers developed a crack just today and I was forced to replace them with modern Tektro calipers just so I could keep riding while I look for the right vintage pair. Keith: the bike does have round front forks and forward facing rear drop-outs. This is a bike I'd like to keep riding in a restored condition; as I ride on some pretty rough roads here in Boston, do you think that the Fiamme or Mavic sprint (road, i assume, i've been able to find pairs online for about $60) rims would hold up, or would I risk damaging them? edit: I grossly misremebered the model number of the Weinmann brakes: they are a mismatched pair of Type 730 rear and 605 front. I don't know where my mind is. Nice bike. It may have round blades, but the fork is not a "track" fork; there is lots of clearance for fenders (and, it appears, eyelets) even with 27" wheels. I guess that it originally used centerpull brakes; probably MAFAC or Weinmann. (The Taylors favored French components on touring bikes) I would look for 27" rims/wheels for it. The 700C just look too small in that frame (and tubulars would look the same). The strength of your wheels to resist rough roads will have much more to do with the skill of the wheelbuilder than with the particular rims you choose. You can easily bring it back to something like its original setup one component at a time, while continuing to use it. Gabe, I expected to see more of a racer, but this is set up more like a tourist, so my suggestions for wheels are not really on. But the frame seems to have enormous clearance, so I now see the brake problem. Your brakes are not really mismatched, but were frequently supplied that way because the rear had more clearance. They also made longer reach brakes, but the longer the arms are you get less leverage on the brakes. I remember some in the 800+ depth. As david says 27 inch wheels were probably original, if you can find some it would be easier. I recently found a Cordova Capri in prime condition...kept in a basement and the seller is asking $100 for it. I have never heard of this make or model, so any info. is appreciated greatly appreciated! I don't think it's a collector bike. If it's a good rider and you need a bike to ride, then it's a good deal. I found this old bike on a pile of scrap metal in Southern Tasmania. I think it's really beautiful, and would like to find out how feasible it would be to restore it. The dudes at my local bike shop were at a loss, partially because few of the parts are contemporary standard sizes or designs. It has a leather seat, branded 'Mansfield 38N', made in Birmingham, England. The wheel rims are marked 'Dunlop Welch, 28 1/2", Australasia'. Under the bottom bracket is the number '54', printed facing out to the left side. Any ideas? I am becoming attached to it, so don't let me down too hard! Its geometry suggests early twentieth century, when there wasn't too much difference between a one-speed road bike and a track bike. The frame details are interesting; cool frame ends, fork crown, bottom bracket (is the BB adjustable on an eccentric, like a tandem?). Looks like a Williams crank, "Major Taylor" style stem, cool brake (I forget the brand). I looks like the rims are not original and the brake isn't suitable for the rims anyway. Does it have a free or fixed wheel? Cool bike. Be cautious about repainting before you know the full story. Chater Lea were making similar high quality frames and components up to the early 1930's. If the chrome plated parts are original then it must be 1930's, but in an earlier style. This frame would have been expensive to build by 1930. Can you find any names on any components? He's seen a lot of badges and might be able to help. I'm trying to find out what a pair of vintage Gobby bicycles would be worth. It is a matching his and her set, supposedly made for the elderly in Sun City, AZ, where the company was based. Can anyone help? Look 'em up on ebay and see if any have sold. If they're low quality, as I suspect, there is probably very little demand for them. "Old" is not necessarily "collectible." Check the archives here (use the google search box) and also check the 3 Price Guides above. I found a picture of a "Gobby" folder and it's evident from the photo it's really bad quality. No wonder the brand didn't last long. Can anyone identify the make and model of this bicycle? The head badge is missing and I have found no other markings or serial numbers on the frame. Could it be French? Components: AVA handlebars, Nervar crank arms, Ideale 42 saddle, Weinmann brakes and rims, Campagnolo Record rear derailleur, MM Atom quick release. Original color may be burnt orange with chrome fenders. Probably French, judging from components. It's hard to imagine someone outfitting a frame so completely with French part if it didn't happen in France. I guess the lugs will tell part of the story. My best suggestion is Automoto, mid 1950's. Some were imported into US. Don't just look at your vintage racing bike, ride it in the conditions it was meant to be used. Cino Heroica is a ride ala L' Eroica, taking part in NW Montana on September 10/11. See http://www.cinorider.com for details. My Schwinn Paramount's serial number is SW 56440. Seems like an odd SN. Post or link to some photos. Approximately how old is it? 1960s-80s? or much older? Newer? Attached is a site to see pictures of bicycle. No bike photos accessible at the linked site. Hi please help i have another bike i have a question to ask, its states on the frame as a BUGATTI but its a sticker not a badge, does this make the bike less of a value? It's a cheap bike, like so many of the car names licensed for use on a bike; e.g. Ferrari, Hummer, Maserati, Jeep, etc. A few brands actually once had a connection to a car or motorcycle brand (e.g. BSA, Bianchi, etc.) but mostly these are just opportunistic marketing ploys using a well-known brand name to promote an inferior product. oh i see. ok thanks for the info. I'm new to vintage bikes and recently purchased a couple to take with us when we camp in our 1978 VW Bus Camper. The first one is women's Evan's bicycle w/ spring front (two springs), tank, and luggage rack. Second bike is a men's Sears Spaceliner. I would like to find out the years, approximate value of these bikes and perhaps even pics of what they look like originally. Thanks in advance for the help! Try middleweight and ballooner forum. hi would like to ask some help regarding my bridgestone bike, if you have any info about it and possibly its value? thanks i have posted a picture of the bike as well on my website..
oh and what would the classification of this bike be? Rick, It looks like a standard UK Hercules from mid 1950's, before Raleigh made them. More typical of one built for the UK market. I LIKE THIS BIKE! IT'S A HERCULES CYCLE AND MOTOR COMPANY BIKE OUT OF BIRMINGHAM, UK LARGE AND FAMOUS FOR MANY YEARS BEFORE RALEIGH BOUGHT THEM IN 1946 RALEIGH MADE HERCULES BIKES AFTER THAT. NICE FIND! I HOPE YOU GET IT READY TO RIDE AND ENJOY THESE ARE FUN! Pre-Raleigh Herc. It's a smaller, less-desirable frame size and it's pretty average condition. I'd guess a couple of hundred if you got quite lucky. Sold thru Firestone tire stores. Probably fairly low quality, so they've been thrown away over the years (gettin' rarer!). 5-speed (derailer?) would put it in the 70s. I doubt you'll find a collector. thank you so much i appreciate it. my friend is having a yard sale and i was looking to seee how much he could sell it for. yes its a 5 speed derailer. pictures of the bike please! and can you wait before you sell it? I can't advise you without pictures and this derailer may be collectable and rare and worth more than you would have guessed ! 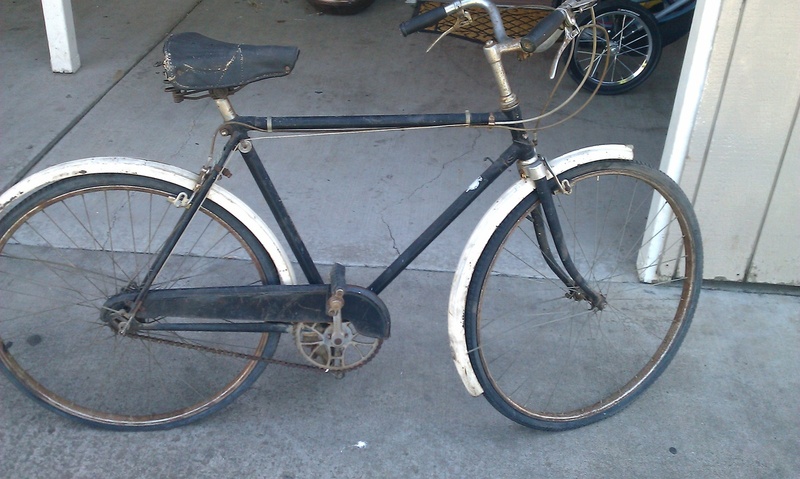 I just acquired a Firestone 5 speed Balerio bicycle for free from a church junk drive for recycling;It's very heavy for a bike but complete,I'm possibily going to restore it or at least get it ridable for a back-up to my 1974 Schwinn Le Tour that I ride daily if it's not raining.I wonder how much money it's worth ? seems low-quality and I don't know if it was made in the U.S.A. or not ?